Thrilled to have 5 of my brooches in the Pin 7 exhibition at ANCA Gallery in Canberra! Opening night is tonight from 6pm at ANCA Gallery in Dickson and runs until Sunday 9th July 2017. So if you find yourself in Canberra in the coming weeks head to the gallery and check out all of the amazing brooches and maybe even get yourself a spontaneous just because gift! Here’s a little sneak peak of one of the brooches in the exhibition. It’s that time of year again and I have some new pieces over at Stanley Street Gallery as part of their annual christmas exhibition, A Time Of Gifts. The exhibition will run until 24th December. Below is some information and an image of the pieces. 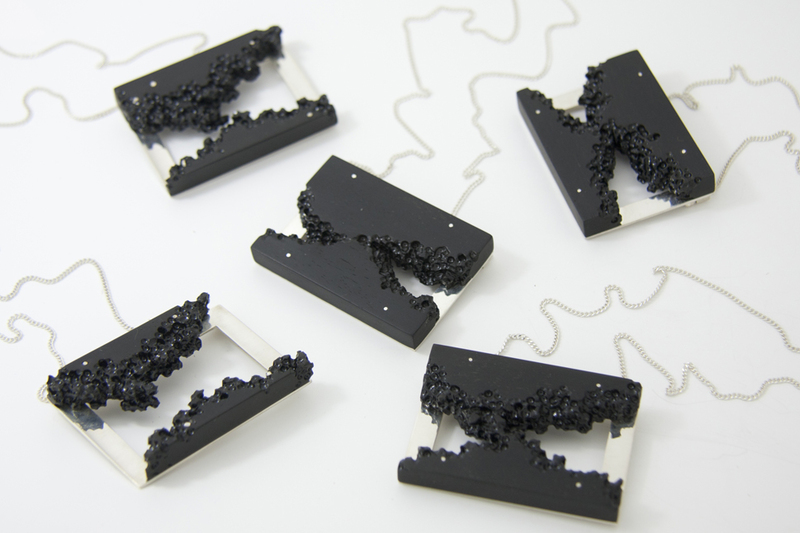 The 5 ebony and sterling silver neckpieces, entitled Honeycomb Erosion #1 – #5, are part of the ongoing series, Weathered. Weathered Series: Whether plant, animal, mineral, built or natural object; time and environment alter the appearance of everything. This series explores the beauty of a ‘weathered’ surface. Fixed to a supporting frame, each surface material is forcibly changed to be imperfect, warn, aged, decayed, eroded. Honeycomb Erosion: The surface of this piece is forcibly warn down to represent what nature does to costal rock over time. If you find your self in Canberra between the 30th June and 10th July, check out some of my new work at this brooch exhibition! Christmas is just around the corner and if you’re looking for a special gift for someone, check out the amazing pieces of work from various artists at Stanley Street Gallery in Darlinghurst. I’ve just dropped some pieces over to the gallery to be part of their annual christmas exhibition, A Time Of Gifts, which is currently on at the gallery and will run until 24 December. 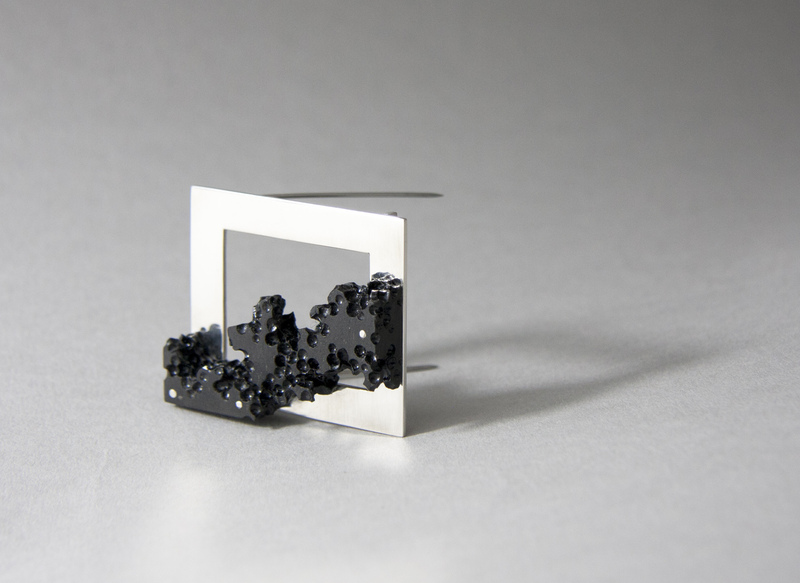 The Imitating Nature | Moon Surface; 2015 ring series (pictured below) are made of sterling silver that has either been oxidised, depletion plated or both to create the surface colour of black, white or black and white. It is a real privilege to have 2 of my pendants (picture below) on display as part of Contemporary Wearables ’15, Thank you to the selection panel and Toowoomba Regional Art Gallery for selecting my work to be a part of this wonderful exhibition. Now for the extremely exciting news… These 2 pendants have now been acquired by Toowoomba Regional Art Gallery to become part of their permanent collection! I was fortunate enough to be able to attend the opening of Contemporary Wearables ’15 at Toowoomba Regional Art Gallery yesterday. It was wonderful to be able to spend some time looking at all the other artists’ works and meet the gallery staff. There is some really amazing work on display and if you find yourself in Toowoomba some time between now and the 1 November please go and have a look, you will not be disappointed. It has been a year of pleasant surprises and today is no exception. 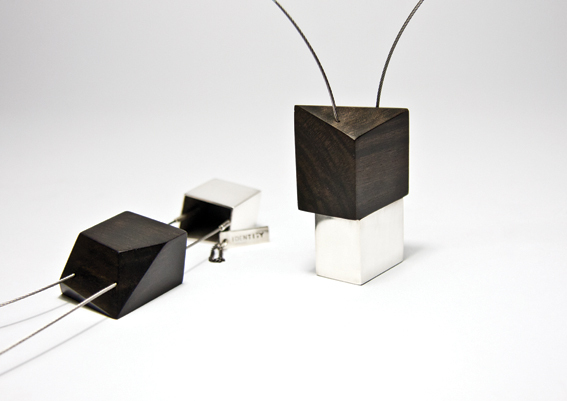 2 of my pendants got selected for Contemporary Wearables ’15 in Toowoomba! The 2 pendants from the series Oppression | Suppression, are new works completed this year and I can’t wait to share them with you all. Stay tuned… I will be posting some images of them at the end of September. Contemporary Wearables is a biennial (every two years) jewellery award and exhibition that showcases works by emerging and established jewellers from Australia and New Zealand. The exhibition is held at the Toowoomba Regional Art Gallery and supported by the Toowoomba Gallery Society Inc. So excited that one of my People Boats, Boats People brooches and one of my “How Potent For Good And Evil They Become” – Sophime sake sets have been selected for the 2015 Contemporary Australian Silver and Metalwork Award! The Contemporary Australian Silver and Metalwork Award is a biennial (every 2 years) exhibition that showcases works by jewellery and metalsmiths from around Australia. This year the award exhibition will be held at Castlemaine Art Gallery and Historical Museum in Castlemaine, Victoria. Last night the Australasian Graduate of the Year Awards were held as part of the Melbourne International Design Week, at Federation Square. Unfortunately I could not make it to Melbourne for the awards night, but I received an email this morning, and I am extremely excited to say that I was awarded the AGOTYA in the category of jewellery design!!! Congratulations to all of the other finalist across the different design categories, I wish I had of been able to see your works and meet each of you. A big congratulations to all for the AGOTYA category winners, Dylan White (University of Canberra) – Object Design; Belinda Rabe (Design College Australia, QLD) – Visual Communications; Emily Robertson (CATC Design School, VIC) – Interior Design and Decoration; Kate Williams (Massey University, NZ) – Fashion and Textile Design; Natarsha Tezcan (University of New South Wales) – Interior Design! Also a massive congratulations to Dylan White, who was not only the winner in the category of object design, but was also award the Overall Award of Excellence! I had the pleasure of meeting Dylan at the NSW/ACT GOTYA night in March of this year. His work is amazing and I can’t wait to see what he does in the future. Thank you to all of the judges, especially the jewellery judges Nicky Hepburn from NorthCity4 and Sarah Ross from Studio Ingot, for your time, support and feedback, as well as selecting me as the jewellery category winner. Also a very special thanks to the Design Institute of Australia, all of the organisers, sponsors and supporters! This is an amazing program and an opportunity for graduating designers and it was wonderful to be a part of it all this year. One of my sake sets has been selected for the Graduate Metal XIV Exhibition in July 2015! Congratulations to Emily Copp, Shelly Jam and Nadya van Ewyk who have also had their work selected for this exhibition. Graduate Metal XIV showcases works by tertiary graduates from jewellery and metalsmithing courses in Australian and New Zealand. It is held in conduction with the 2015 Jewellers and Metalsmiths Group of Australia (JMGA) Conference entitled Edges, Boarders, Gaps. Click on the link below to find out more about exhibitions that will hosted by Galleries around Sydney.